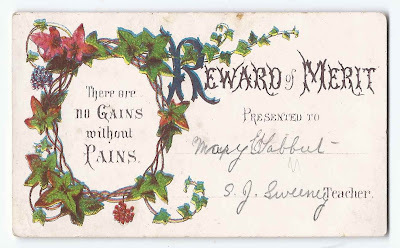 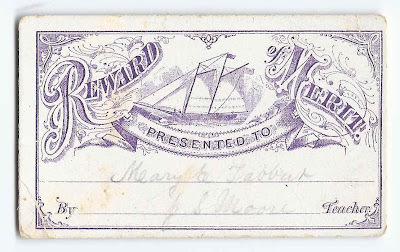 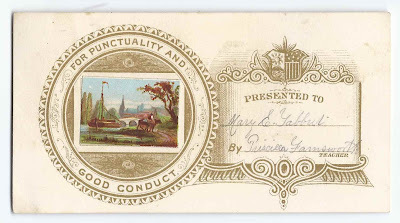 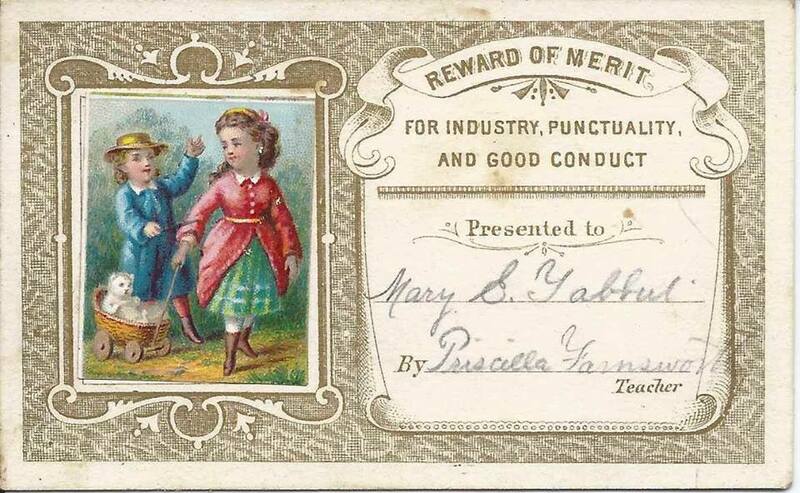 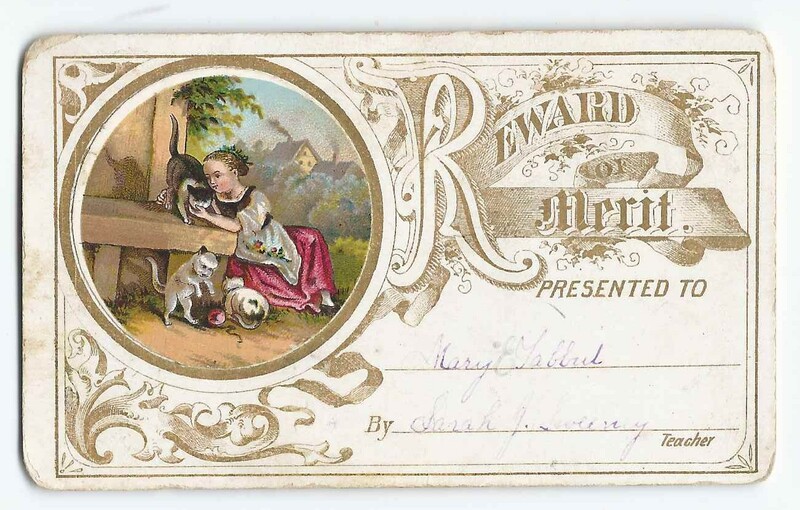 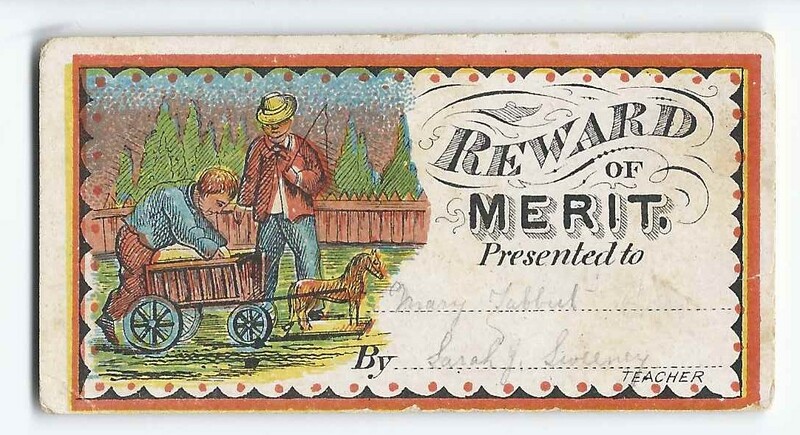 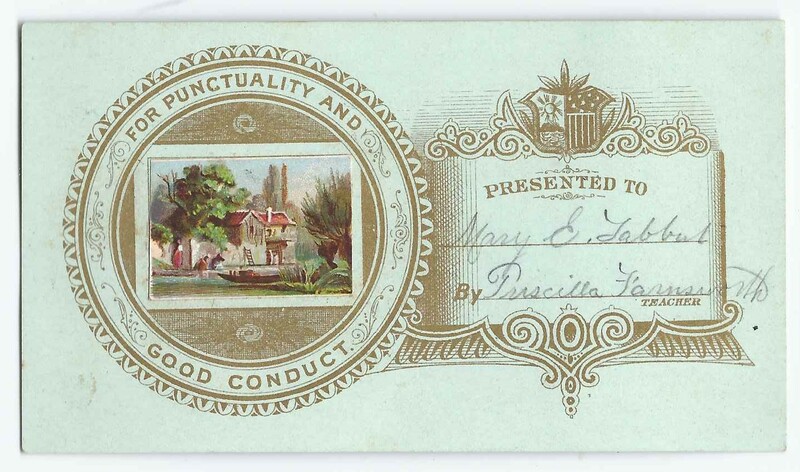 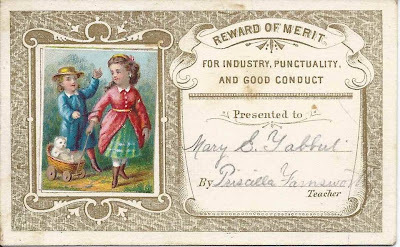 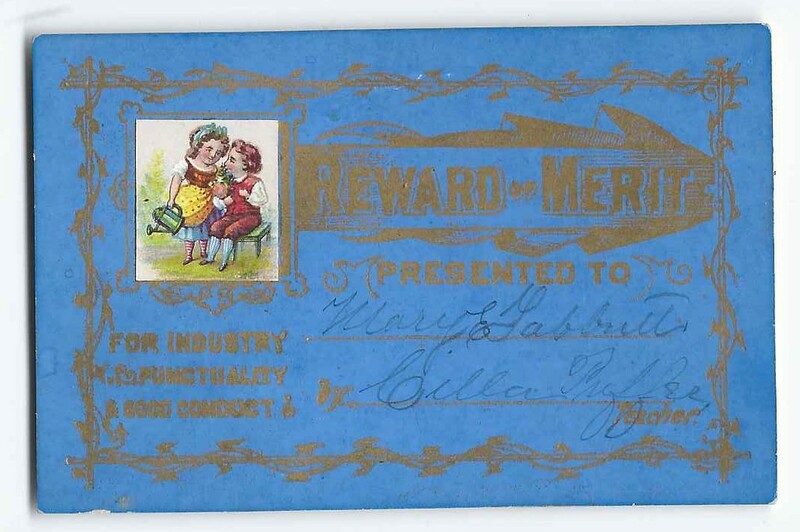 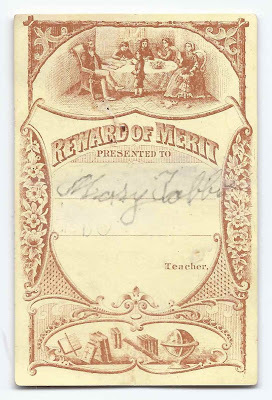 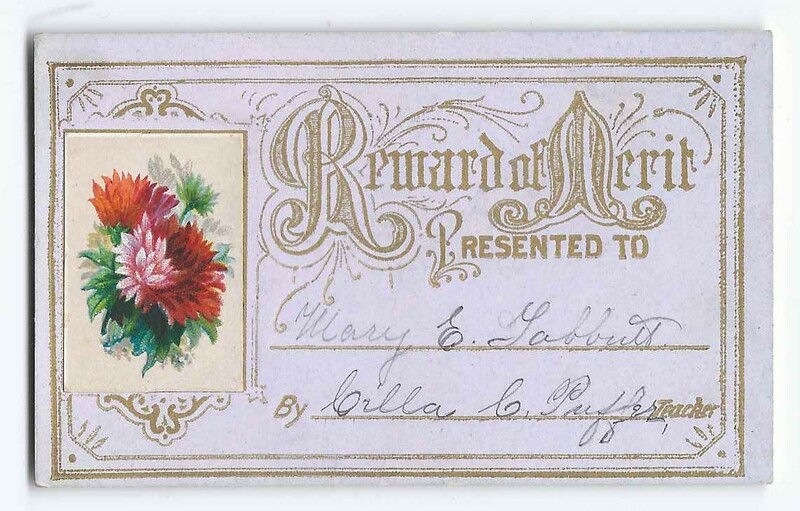 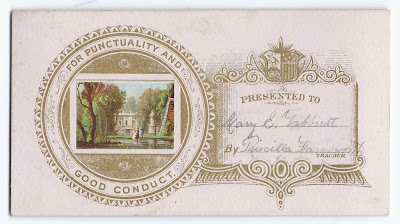 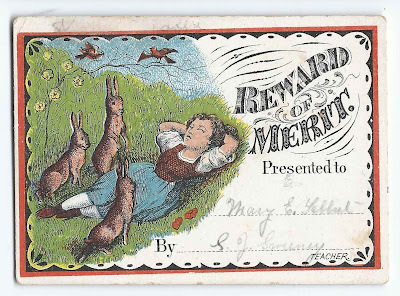 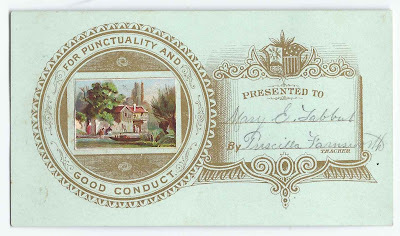 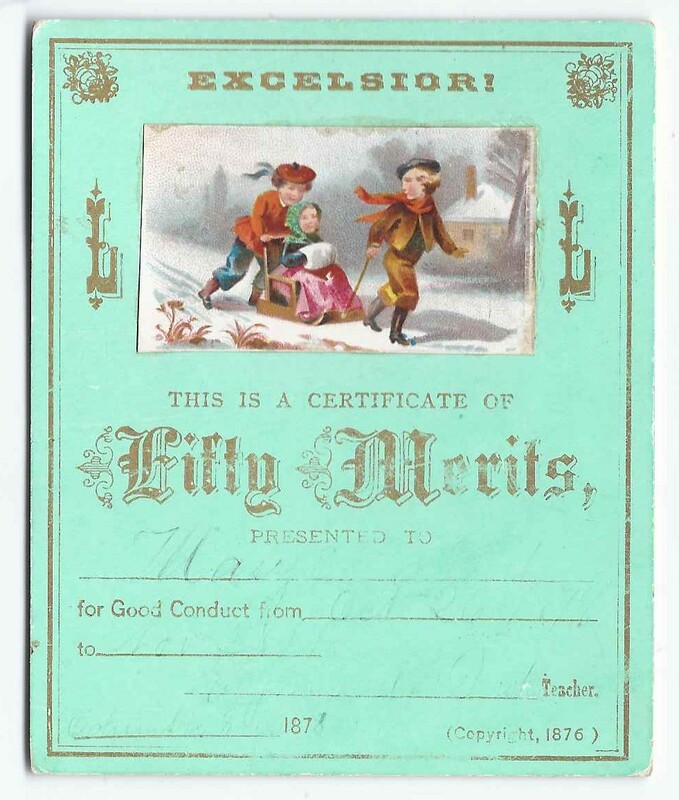 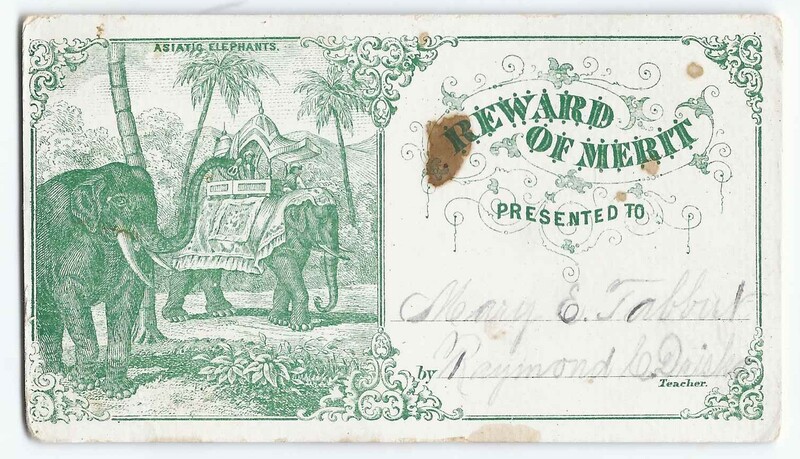 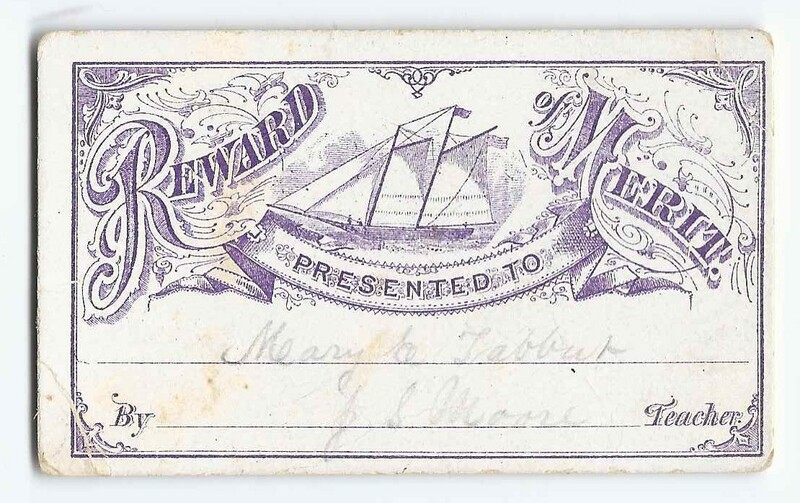 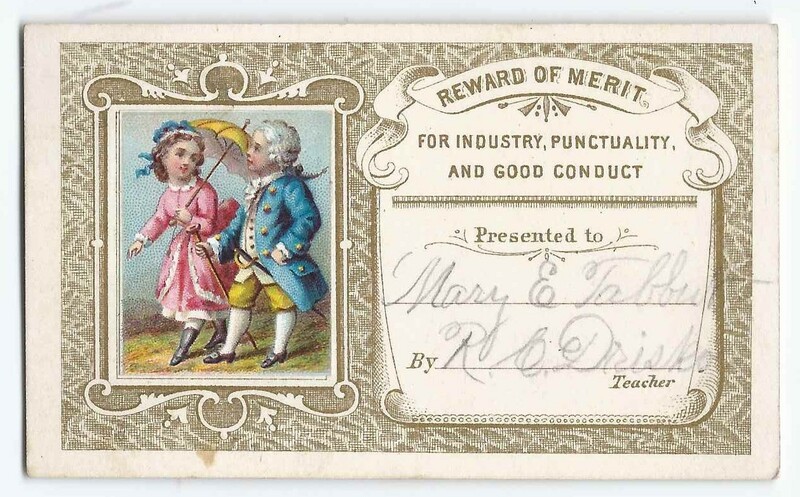 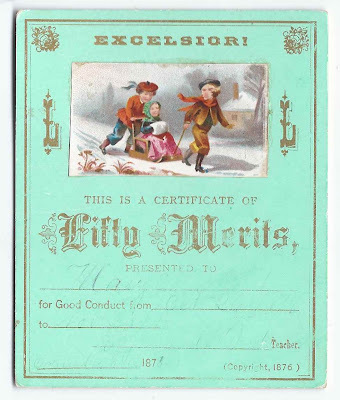 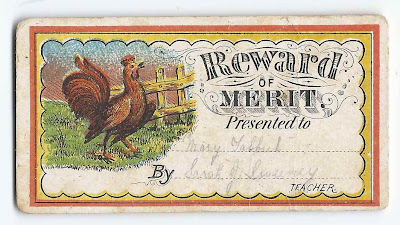 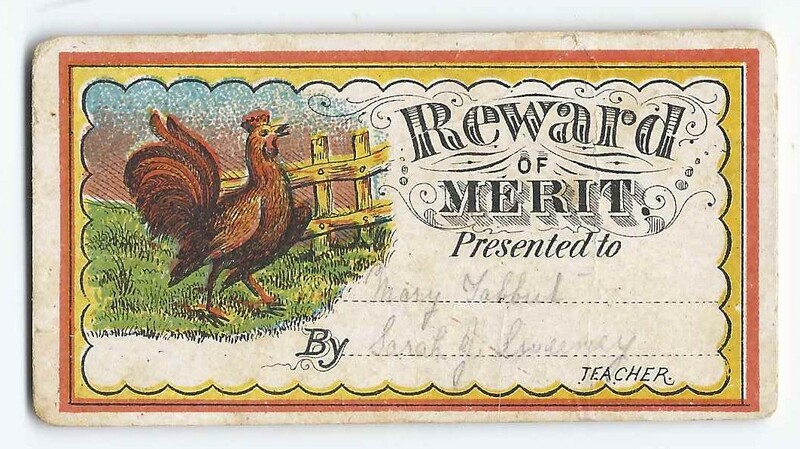 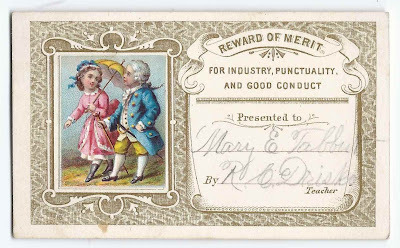 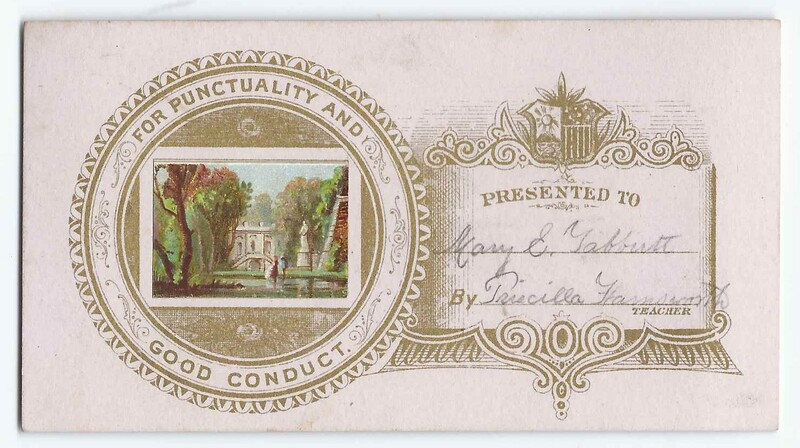 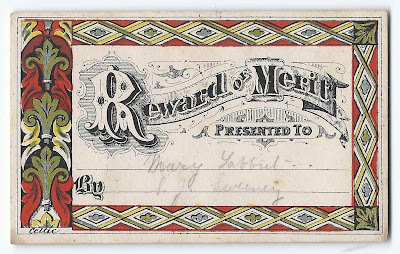 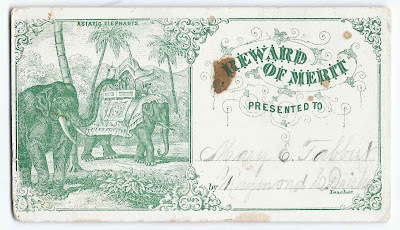 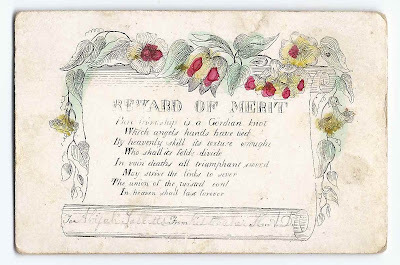 Collection of Reward of Merit cards presented to Mary E. Tabbut, nicknamed Mamie, of Columbia Falls, Maine, by several of her teachers. Raymond C. Drisko, born Raymond Chandler Drisko at Columbia, Maine, on 11 August 1852, son of Eri Hathaway Drisko and Elizabeth Robinson (Tabbut) Drisko; m. cousin Laura Isabel Drisko. 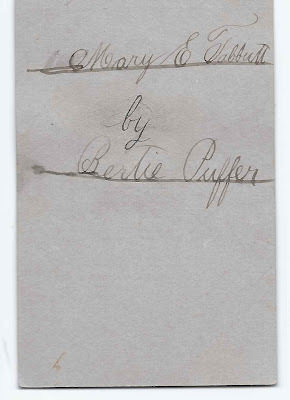 Bertie Buffer - If you have information on Bertie, please leave a comment. 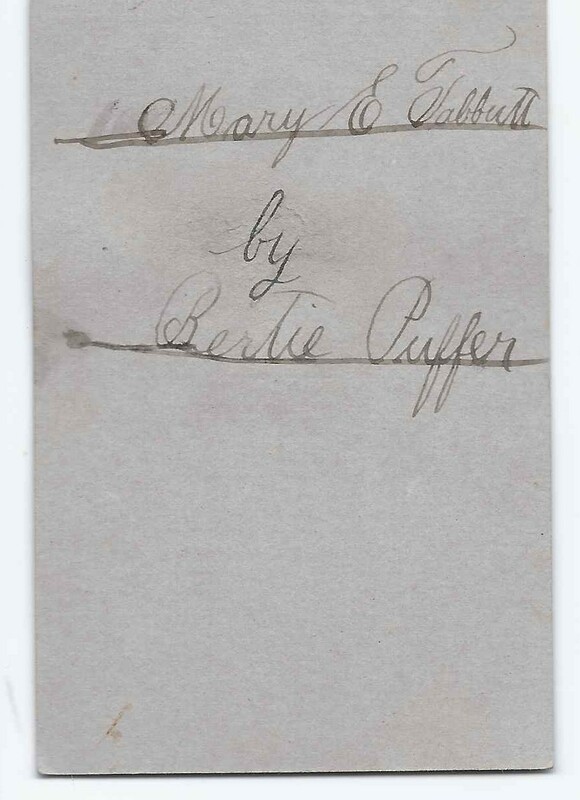 I don't know whether Bertie was a male or a female. J. S. Moore - if you have information on J. S. Moore, please leave a comment. 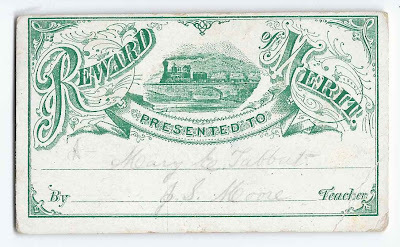 Again, I don't know whether J. S. Moore was a male or a female. 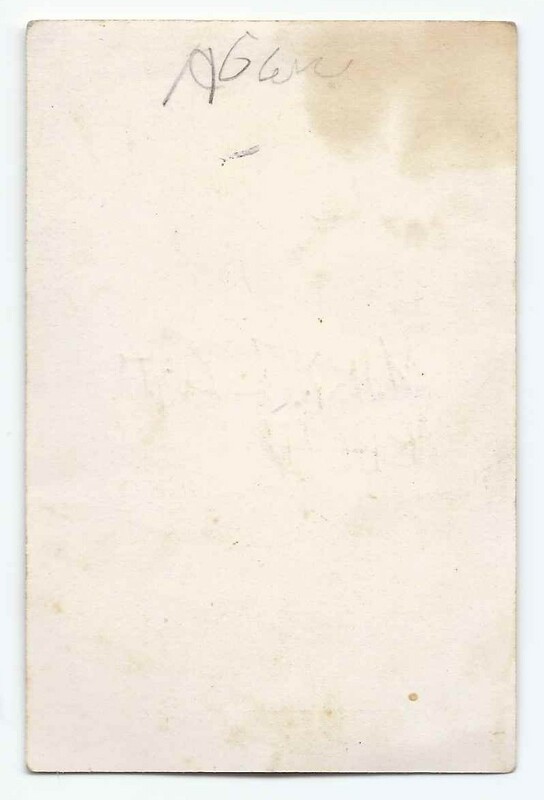 H. A. D. - I'm tempted to think that the initial D stood for Drisko but am hoping that a reader will recognize the initials as belonging to someone who had a stint as a teacher at Columbia Falls, Maine. 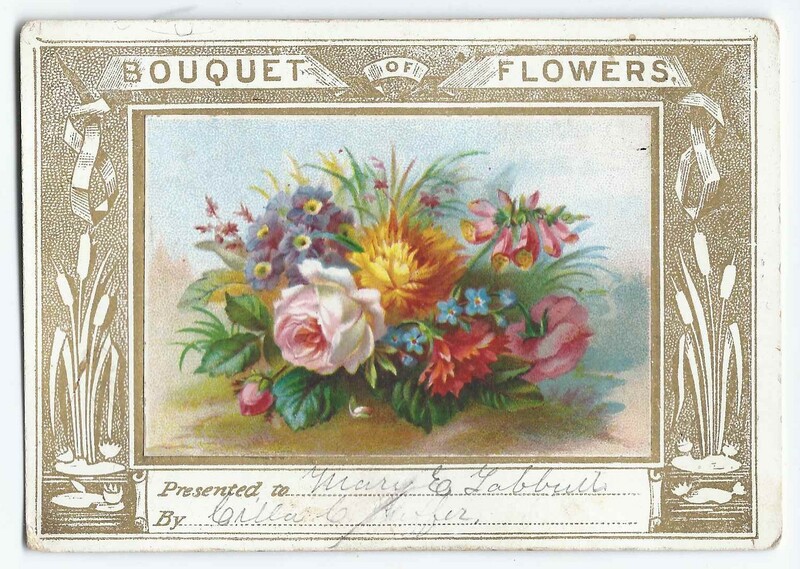 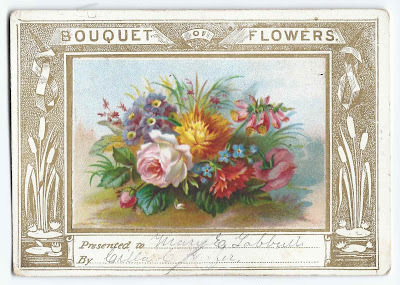 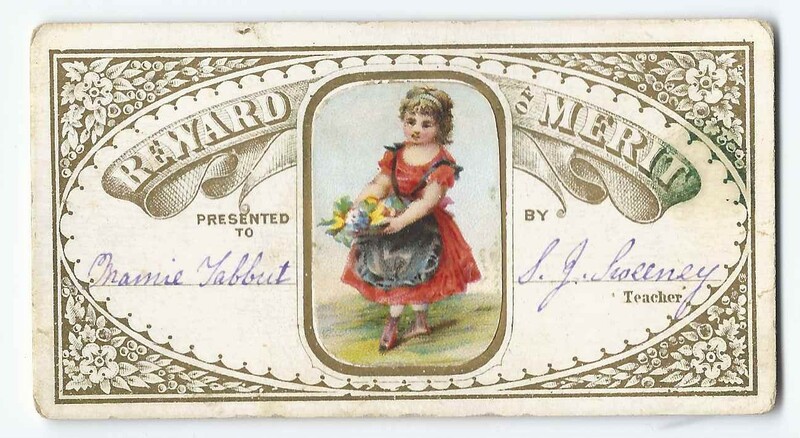 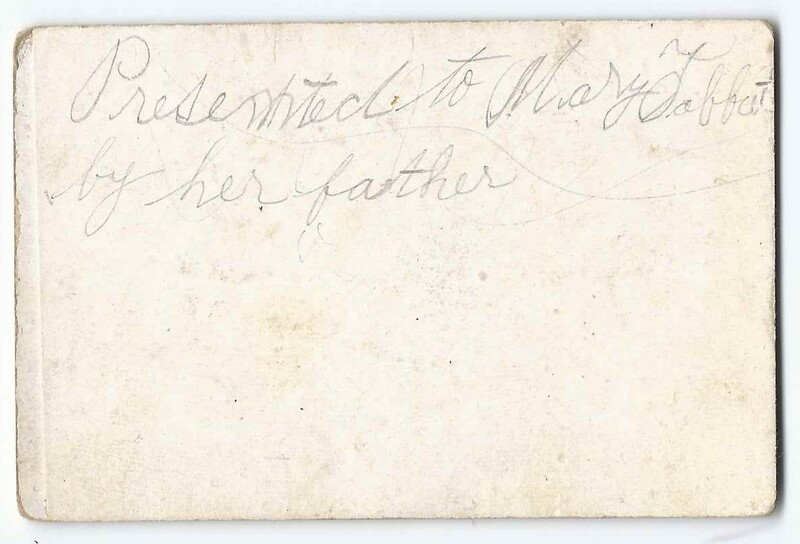 One of the cards has the name of Mamie's father on it; on the reverse is text showing that he presented it to his daughter. 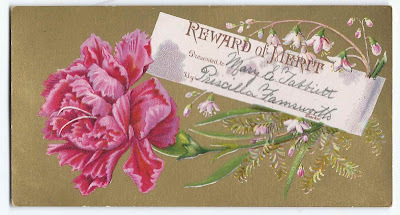 The teacher was the unknown H. A. D.
Mary Ella Tabbut was born 28 April 1868 at Columbia Falls, Maine, the daughter of Abijah Worcester Tabbut and Aurilla (Floyd) Tabbut. 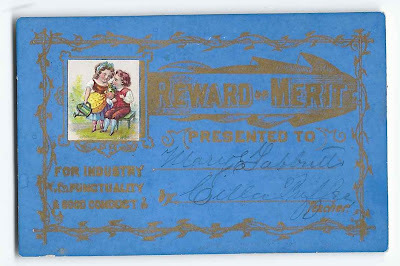 Abijah is credited with the invention and manufacture of the blueberry rake, a tradition carried on by his grandson Clarence Holmes Drisko, Mamie's son. On 27 July 1892, Mamie married William Pitt Fessenden Drisko, son of Joseph W. and Isabella Frances (Farnsworth) Drisko. 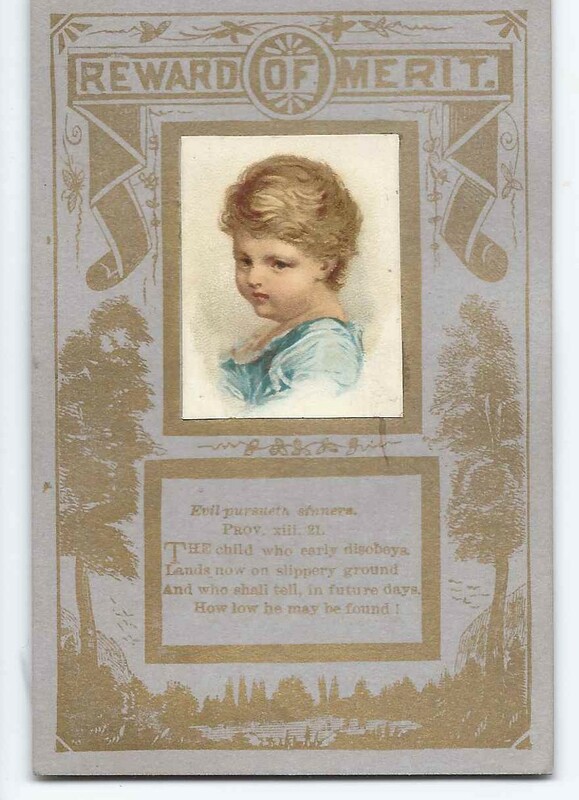 He was born 1 December 1869 at Jonesboro, Maine. 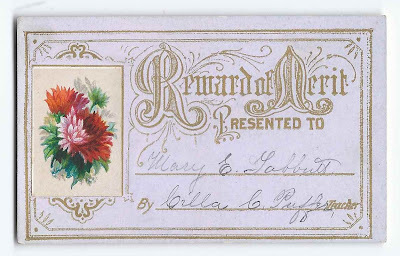 Mamie's widower William Pitt Fessenden Drisko married Rose Mae Bagley, daughter of Richard and Sophronia Bagley, on 7 June 1900. 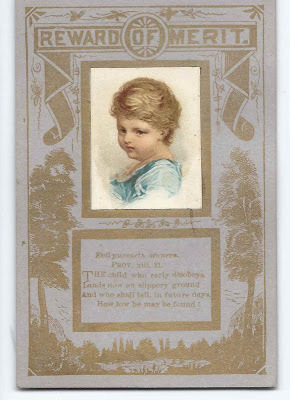 They had a daughter Ruth before William himself died young, I think from Tuberculosis, on 7 August 1901. 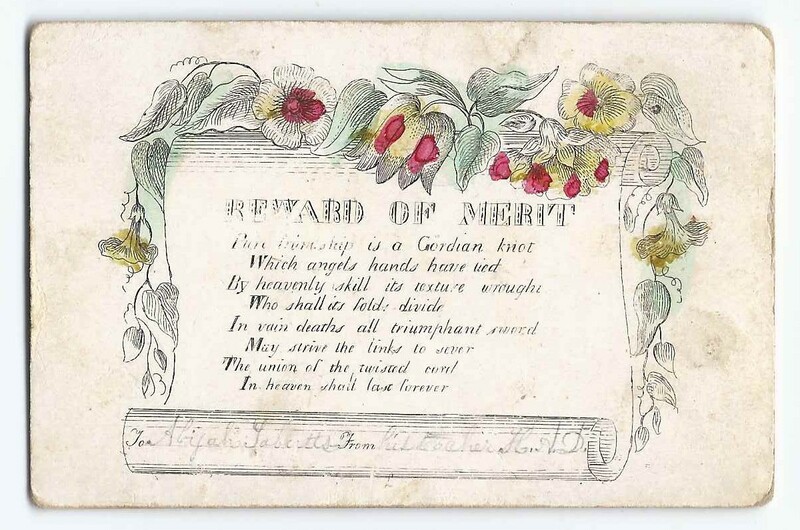 If you have corrections and/or additions to the information above, or information on any of the teachers, please leave a comment or contact me directly. 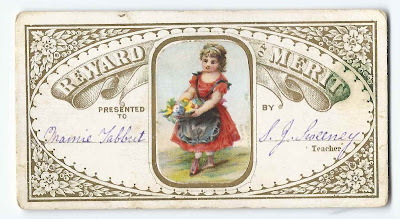 I'm interested to know much it would cost for these items? 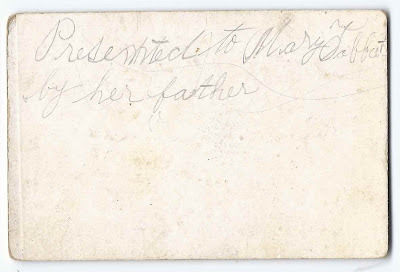 Mamie was my great, great grandmother on my mother's side -- her oldest son, Clarence, was my great grandfather, and my grandfather, William Henry Drisko, was Clarence's eldest child.